The Cineo Matchbox On-Camera RPT Light with Shoe Mount from VariZoom is equipped with Remote Phosphor Technology (RPT) panels activated by LEDs for accurate color output and glare-free, broad dispersion. It comes with an AC adapter (6' line cord, 12' of output cord), but it can also be powered from a variety of 6-26 VDC batteries using the back-mounted Sony NP-F battery plate or D-tap cable (sold separately). A standard 1/4"-20 female socket on the base of the unit allows for a range of mounting options. 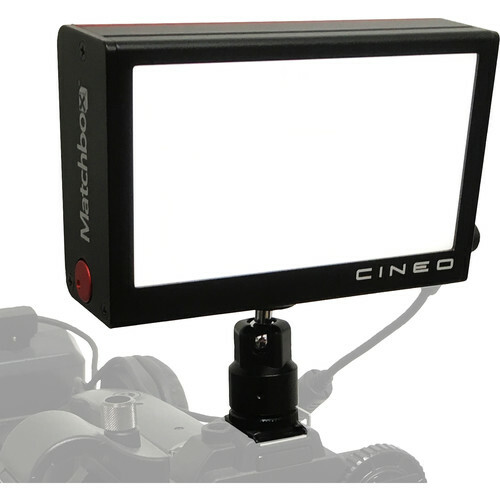 This on-camera light can be used as both a compact field or studio light due to its rugged, flexible design. Box Dimensions (LxWxH) 7.4 x 5.4 x 4.9"